Are you looking to give your finances an overhaul? Do you often wonder where all of your money is going? Even after strict budgeting practices over the last two years, I still ask myself these questions. Sometimes I feel like I could still do better with my finances, but I don’t often take the time to sit down and solve the money problems that have once again found their way into my everyday spending. My wife and I have recently moved back to our hometown of West Michigan, and let me tell you, life has been busy! Friends, family, and distant relatives seem to be coming out of the woodwork to visit. We have already attended multiple wedding showers, birthday parties, baby showers, and general get-togethers – all of which have drained our pockets considerably. We love the people in our lives, but sometimes we need to prioritize between the over-indulgence of gifting and the necessity of saving and planning for our future. Because of the low interest rates and the severely reduced price of houses in our area, my wife and I have decided to stop throwing our money away on rent and are taking the plunge into home ownership! Due to our newfound “family fun” expenses, we have decided to cut back on our initial housing expenses. These include items such as the dining room set, living room furniture, bedroom furniture, among others. With our newfound spirit of living cheaply while making these purchases, the scouring of Craigslist has begun! Basically every day, both my wife and I searched for furniture in the nearby area. Within a few days of the first search, I found a gem: an early 1900’s walnut table and 6 chairs (including the papa chair for me) for $50. That’s right, $50. Of course, this table had swirls of marker drawn on the table-top, a few knicks and dings on the chair and table legs, and of course had an overall sense of wear on the finish, but what I saw was beauty (and not just because it was only going to cost me $50, the table looks pretty sweet). As my wife and I began to strip this table down to its original wood base, I realized the similarities between our new financial decisions and this walnut table project. 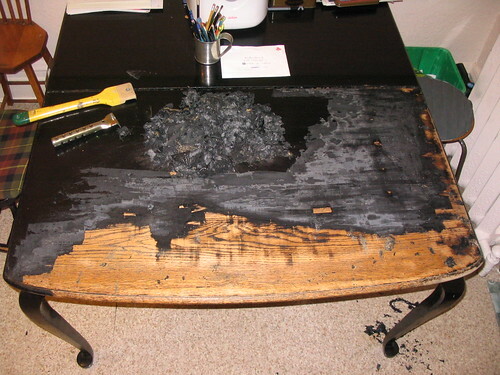 Much like this table, our finances were in a dilapidated state. They were in need of a transformation; it wouldn’t be easy, but with much persistence and love, we both knew that the transformation could occur. This table took exactly the same efforts. We have recently stripped away those marker lines and puttied up those cracks. Soon, we will refinish this wood into the beautiful dining set it was meant to be. I challenge you to do the same with your finances. First, you must recognize that your personal finances can be improved. Second, you must pinpoint where the cracks are – what expenses could you do without? What is it that is draining your bank account each month? Third, you must fill in those cracks. Take out that putty and fill in those financial problem areas. Decide to put a stop to those unnecessary expenses and begin to live within your means. Finally, you must put that beautiful finish on your personal finances. Those cracks may already be filled in, but until you figure out how to live without those expenditures (ie. learn to purchase more inexpensive alternatives), your finances will not shimmer in the sunlight. Rather, it has the potential to slip back into its dilapidated state. Put those finishing touches on your financial table, and it will hold up for many years down the road. Did this illustration help you? Follow these four steps and you will soon discover your financial greatness! I’m glad you’re more eager to plan out your expenses! It will take a while before you get the hang of it, and unexpected expenses will always arise, but if you’re prepared for them, you’ll have plenty of savings left over! Great job! Nice find on the table. You’ll need to keep track of costs and post pictures after it’s done.